Home / Data Privacy / What tools does Helpshift provide to assist me with my COPPA compliance efforts? The materials available on this page are for informational purposes only and not for the purpose of providing legal advice. You should contact your attorney to obtain advice with respect to any particular question or issue you may have. COPPA is the Children’s Online Privacy Protection Act. It is a United States federal law designed to protect the privacy of children under the age of 13. Among other rules, COPPA requires certain websites to receive parental consent prior to collecting personal information from their users in certain circumstances. If your app needs to be COPPA compliant, you cannot collect the personal information of such users, known as personal identifiers (PIIs). These include any information that allows someone to identify or contact a child such as full name, home or other physical address email address, telephone number, social security number, debit card numbers, social media profiles and other information about the child or parent that is collected from the child and is combined with one of these identifiers. If your app needs to be COPPA compliant, you cannot collect what COPPA refers to as personal identifiers (PIs). PIs are any single piece of information that could allow someone to find an individual in real life. They include date of birth, home location, school location, full names, phone numbers, debit cards, and social media profiles. 2. Under ‘App Settings’, select the app you’d like to manage this setting for. 3. Scroll down to the ‘Mobile SDK Configurations’ section. You’ll see an ‘Allow anonymous Issues’ toggle which you can click to switch ON to enable this setting. 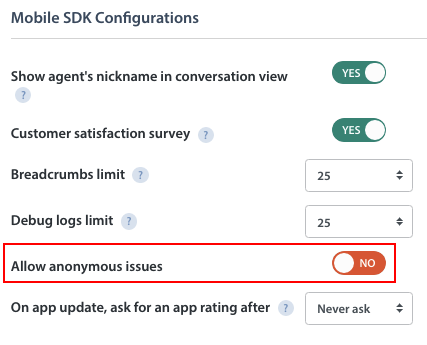 Please note that this setting will apply to all users of this app; name and email will not be displayed in the Dashboard when they submit Issues. Unlike the allow anonymous Issues flag, you can set the enableFullPrivacy flag to True specifically for users under 13. To enable the enableFullPrivacy flag to prevent registered underage users’ data from being collected, please see our developer documentation for iOS and Android. Please note that this flag should only be used to mitigate potential COPPA concerns. Provide a full set of FAQs for underage users to review, which may prevent initial support contact in the first place. Use a contact portal other than the default to prevent your company from accidentally storing information about children reaching out for support. If you have enabled Helpshift privacy features, we advise you to train your Agents to refrain from using Helpshift’s follow-up feature within Issues, and to refrain from adding users under 13 to user segments for proactive Campaigns. COPPA discourages contacting such users unless the contact is user-initiated. Use the metadata field named “Privacy Mode” to learn if the user had filed an Issue with the enableFullPrivacy setting enabled. When engaging with these users, Agents should avoid asking for personally identifiable information (PIIs). Please note that this feature is available for Helpshift SDK v6.1.0 and above. Helpshift can also redact sensitive information from Issues for you if your COPPA compliance efforts so require. If you need information deleted from an Issue, please reach out to our support team via our contact us form.